A favorite night market snack, xiao rou bao have a filling that is similar to gyoza or jiaozi, your common Chinese and Japanese dumplings, but instead of a thin wrapper these are encased and cooked inside an airy dough. Street vendors steam them in large pans and finish them by crisping up the bottoms. Buns filled with just vegetables, typically cabbage, called tsai (vegetable) bao (bun) are easy to find and equally delicious. 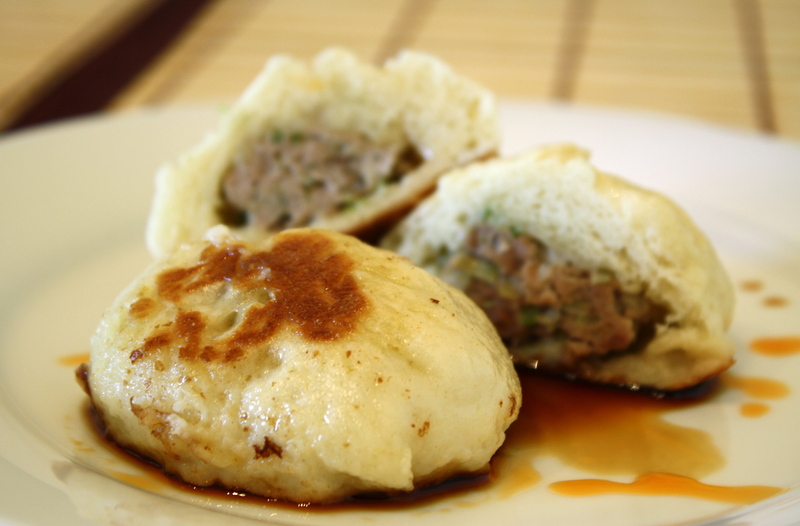 The literal translation of xiao rou bao is small meat bun. In Taiwan it’s pretty much a given that the filling will be pork. I’ve beautified the English name here because I didn’t think a recipe suggesting mystery meat would be particularly enticing to my Western readers. Fingers crossed one day a mad scientist will invent a time travel machine, but until then I’ve found that the best way to relive cherished memories is through flavors. This is my attempt to transport myself to a bustling night market in Taiwan. Whether you’re making this dish after a recent trip to Taiwan or creating a new food memory these soft bundles of goodness are sure to extract squeals of delight from you and the lucky friends you share them with. The recipe below makes 10 buns. Dissolve sugar and yeast in ½ cup warm water. While the yeast is proofing (sitting and activating) mix the flour, baking powder and salt in a large bowl. Pour the wet mixture into the dry one, add oil and mix until smooth. Knead very lightly and briefly in bowl. Cover and let dough rise for 40 minutes. 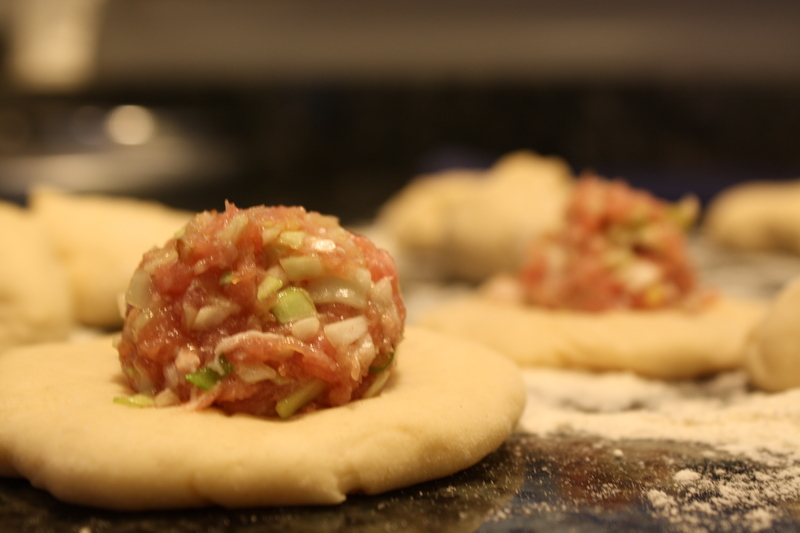 While dough is rising mix all the pork filling ingredients together in a bowl. Once the dough has finished rising turn it out onto a floured surface. Knead lightly and divide into 10 equal sized balls. If you’re gadget crazy and have a scale they should be approximately .80 oz. each. If you don’t, simply make each one a little larger than a ping pong ball. Press into small thin rounds. 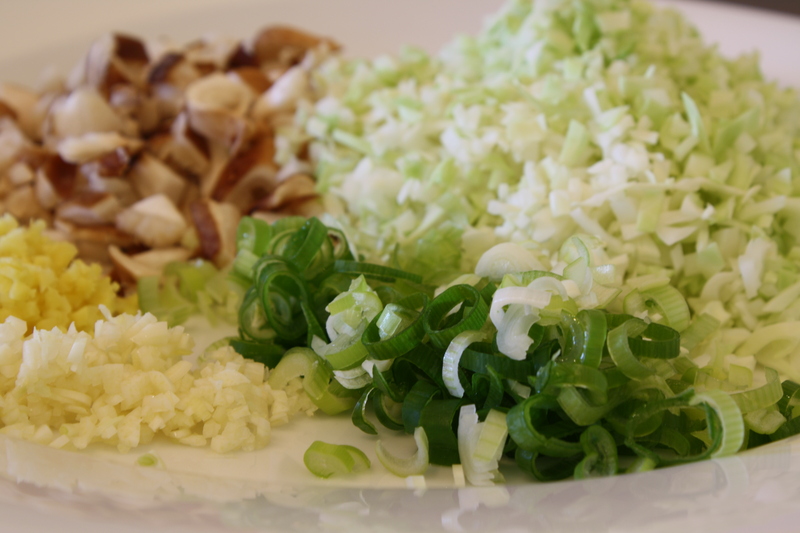 Fill each with a tablespoon of the pork filling. Seal by pinching dough together at the top. Heat a skillet and one tablespoon of oil over medium heat. Add pork buns. Brown the bottom of the buns for 15-20 seconds. Add 1½ cups water, cover. Steam buns until all the water evaporates, about 10-15 minutes. Once water has evaporated and the buns have double in size remove the lid. Finish by browning the tops of the pork buns. Domenica, thank you so much! I hope your son like these. I’m done with the restaurant kitchen (…post about this coming soon) but not the food world. Concentrating on writing and other food related stuff. Would love to get together sometime soon. Can’t wait to hear how the pork buns turn out. Sharon, this looks delicious and not terribly difficult to make for someone who is a stranger to the kitchen like me. Thanks for sharing! You’re welcome! I think you and Drew are going to love them. If you’ve never worked with a yeast dough before then your first time might be a little tricky, but I know you’ll be a pro in no time. Drrooool … pictures are perfect. You took them? Thanks! Yup, the pictures are all taken by yours truly. ← I Dream of Scooters and Street Food.